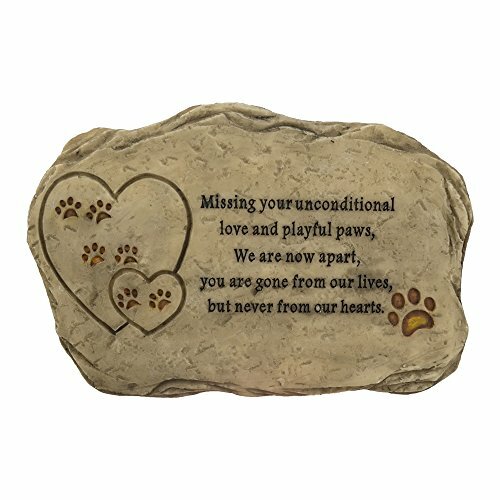 【Unique Design:】It has the look and feel of a real stone and marked with "Gone from our lives, but never from our heart". It is suitable for your lovely pet. It is predicting your eternal love for them. 【High Quality Material:】 The photo frame is made of resin as the main raw material and is a non-toxic and environmentally friendly chemical raw material. 【Writing is carved:】It is durable and will not be damaged by bad weather. 【Product Size:】 The product size is 8.85(L) x 0.45(W) x 5.85(H) inch. Perfect for outdoor garden. If you have any questions about this product by Petcabe, contact us by completing and submitting the form below. If you are looking for a specif part number, please include it with your message.